Pharmacy Rx Solutions is located in prestigious Tampa, Florida, and specializes in hormone replacement therapies for both men and women, including Human Growth Hormone, Testosterone, HCG Weight Loss Plans, and Hormone Replacement Therapy. Our therapy packages come from our sister company, Suncoast Radiopharmacy Services, which is a licensed U.S. pharmacy permitted to dispense made-to-order, prescription-based formulas for our customers’ unique needs. Customer satisfaction is key to Pharmacy Rx Solutions, which is why price and service is important to us. Pharmacy Rx Solutions believes in taking care of the customer by using a synergist approach to customer service that involves the clinic, physician, and pharmacy. Our CEO, John Gangemi, has over 30 years experience in the Healthcare industry. He has been in senior level management positions with several public companies for the last 15 years. He has over 20 years experience in I.V. 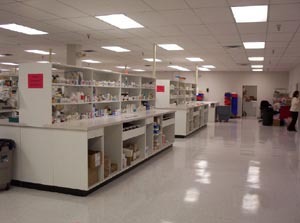 pharmacy, closed system, and compounding pharmacy specialty industry. John was formerly associated with NuLife Solutions.